Cow (Dung) College? 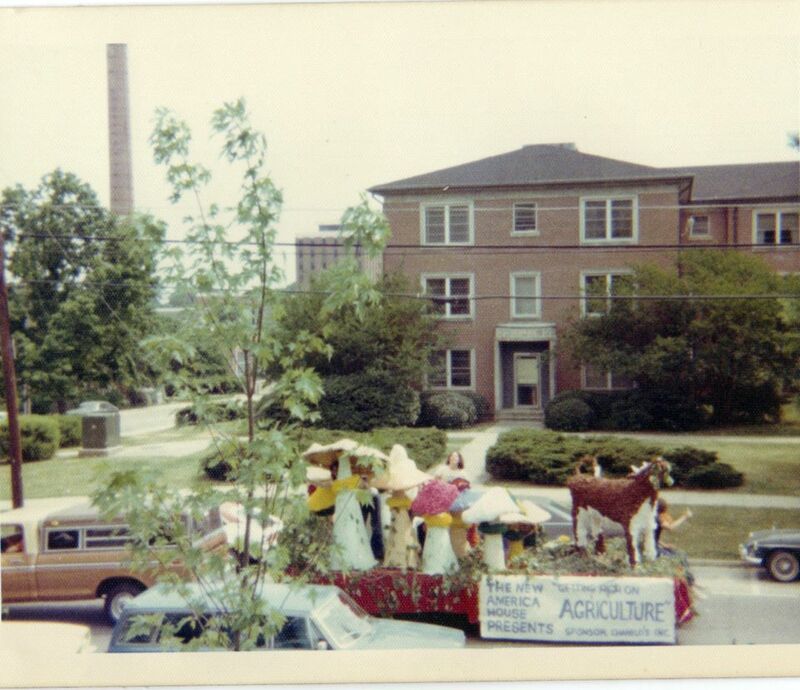 The Best In Show float from Auburn’s 1976 homecoming parade was built by the residents of the New America House located on Magnolia Avenue across from Noble Hall. This photo was taken from the house’s front porch. 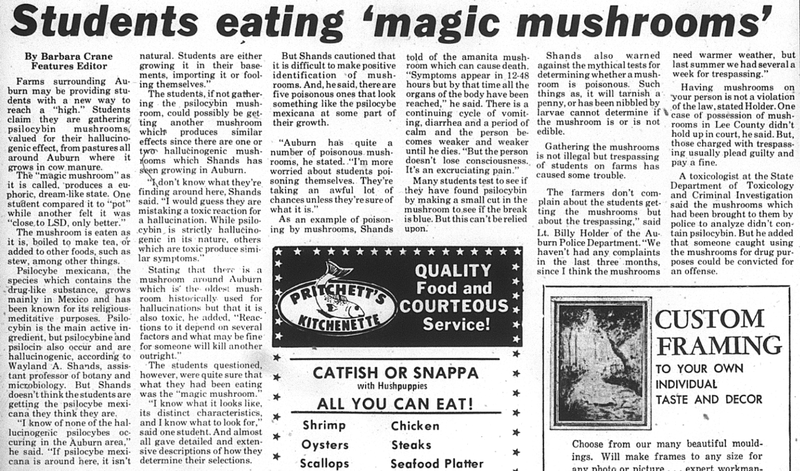 Magic mushrooms came to Auburn in 1973. Or at least awareness about them them did; the Auburn botany and microbiology professors the Plainsman kept interviewing for shroom stories were almost positive the things being harvested out of the manure dotting the pastures of Lee County for the past year or so were not, in fact, psilocybin mushrooms, and that the longhairs must be mistaking the toxic shock of some sort of fatal Auburn fungi for psychedelic hallucinations. 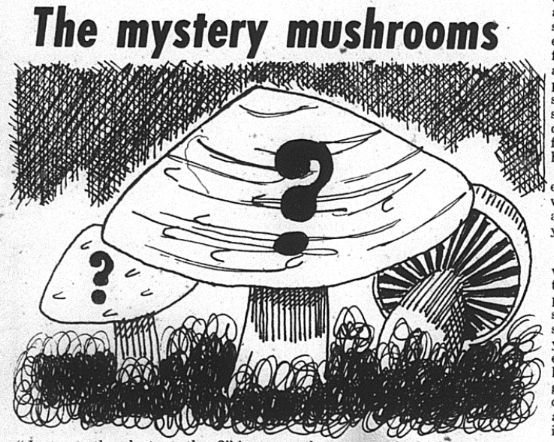 There were four stories in four months starting that February, most questioning whether or not shrooming was technically illegal, but advising folks to maybe find another hobby regardless (what with poison and all). Judging by Auburn’s 1976 homecoming parade, the coverage did little to put a damper on the past time. Because not only was the float built by the New America House (362 W. Magnolia Ave) and sponsored by Chanello’s Pizza (the preferred parlor of Auburn’s counter culture) allowed in the parade… not only was it named the best independent float… it was named the best float in the entire homecoming parade that year. The 1976 parade’s theme: Favorite Pastimes at Auburn. Those judges had some high standards. Related: The best float in Auburn’s 1968 homecoming parade literally floated. We’re documenting the evolution of homecoming at Auburn for the rest of this week. Like, nonstop vintage homecoming action. I’m excited. Go here.